I apologize for not posting this week. My site got updated, but the photo part crashed and it took some time to get everything in order so I could post again. Thank you for bearing with me. I also had to learn to use the new system, which will make it easier to load and transfer photos into my blog, which was time consuming. This shortens the task a bit. Let me say right upfront, I like ranch homes, especially the ones that have been renovated and updated to reflect their often new young owners. Many early ranch homes employed an open living concept long before it became de rigueur. This home had already been architecturally updated, but the interior design had not. The young owners required a quick turnaround time, and New York designer Patrick Mele took on the challenge completing it in one summer. 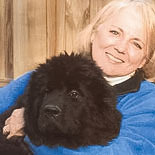 I first saw Mele’s work in an issue of CT Cottage and Garden and have since become a huge fan. He is young, very talented and has the ability to merge varying styles and eras into chic, sophisticated and approachable interiors, like the one featured here. 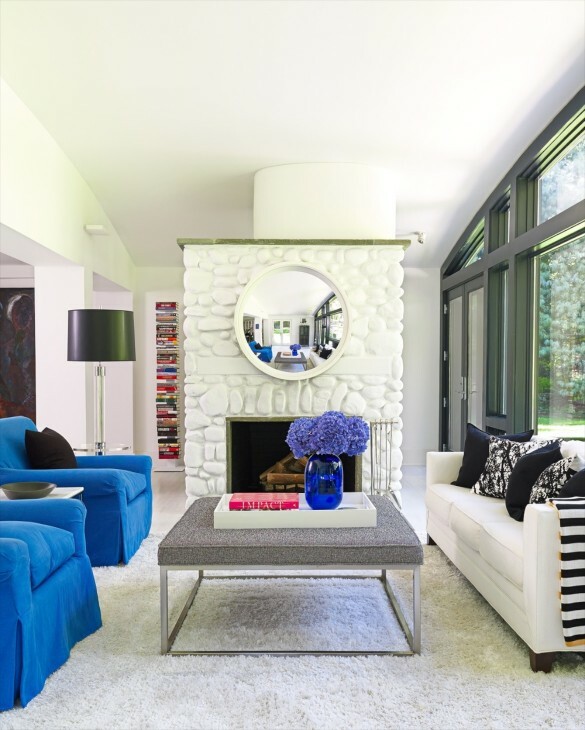 Colbalt blue is a favorite color for me and few color combinations are more glamorous than black and white with cobalt as an accent. 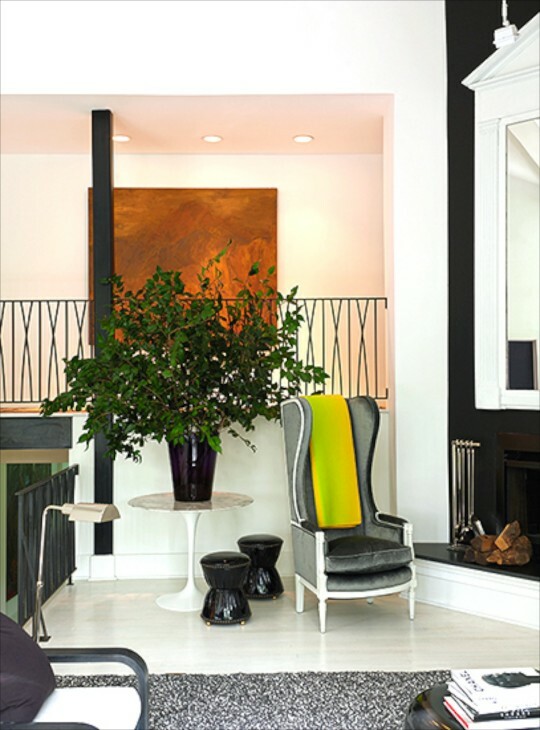 This home showcases the color combination flawlessly. I really look forward to enjoying and sharing many more of Patrick Mele’s designs. All photos are by Timothy Kolk. Clean, bright, crisp, and uncluttered, yet so inviting don’t you agree? The stack of books with blue and red brilliantly bring the eye to the space beyond. The read coffee table book connects the entire vignette. The floor lamp on the left with the clear base again, allows the eye to travel instead of stopping it. 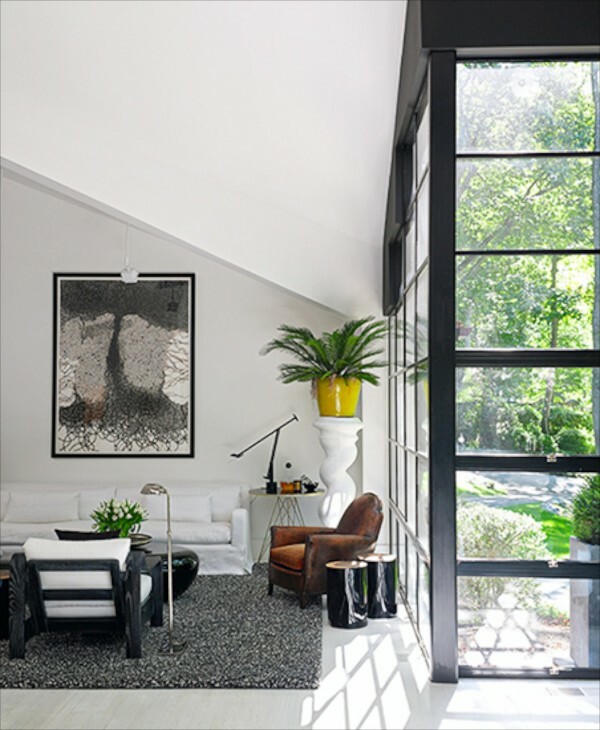 The beautiful black framed window allow so much light to enter. The yellow pot on the curvy pedestal provides a wonderful pop of sunshine color. A narrower view of the living room. The chairs were upholstered in cobalt blue linen. The lady of the house loved the Caribbean and the blue was acknowledging her bent. The couple acquired the home from one of their mothers, and her artwork is stationed throughout the rooms of the home. She is still alive, so she gets to enjoy the the homes new vision as well. Another view of the room above where the fireplace wall is painted black. Other than the occasional black wall, all others walls are painted gallery white, and all floors are bleached white. The yellow blanket on the chair echoes the big yellow pot (seen in earlier photo and below) that sits on a pedestal off to the right but out of view in this photo. The mirror is amazing, in scale and design. It reflects of black trimmed windows and almost looks like a piece of abstract art. Another view of the room above and the yellow pot with a palm in it. The rooms in this home are beautifully scaled. Nothing seems out of balance. I love Mele’s use of a brown leather chair as a visual relief from the black and white. Such a bright yet serene breakfast room. 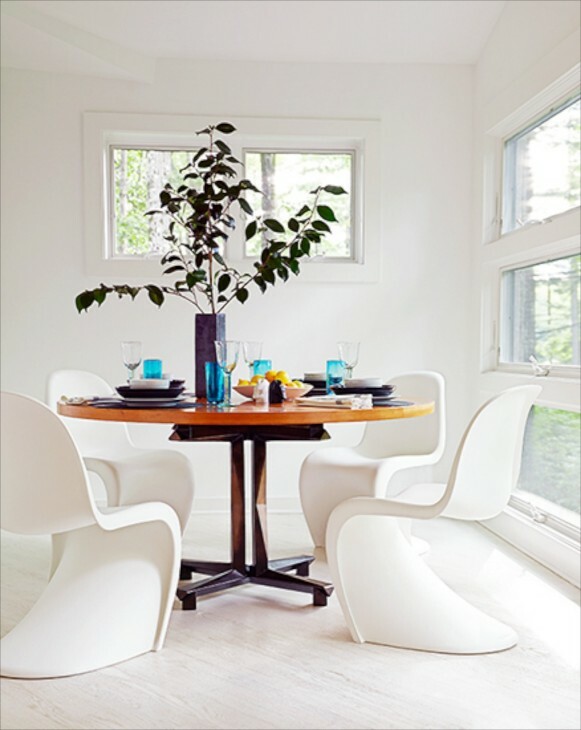 I love the Pantone chairs, and the tiny pop of turquoise blue on the table. Vintage lamps in colbalt and turquoise continue their presence throughout the home. There is even one on the grand piano. I like that he chose a black and white fabric for the shiny metallic bench. 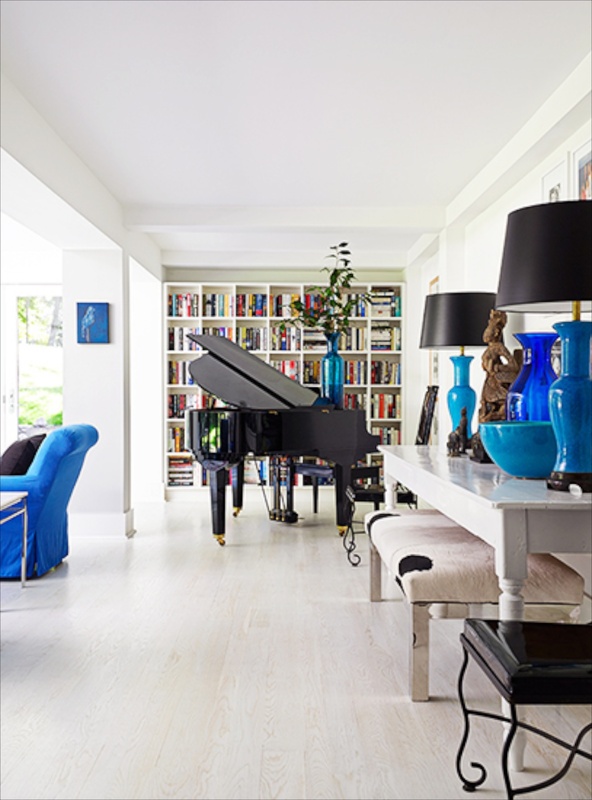 The books behind the piano create a feeling of a large piece of art because of the way the books are placed horizontally and vertically, and because of the color choices. Eclectic and symmetrical. Here we see a repeat of red in the back of the cabinet. The light in the room, especially at the ceiling seems to create a sculptural effect. 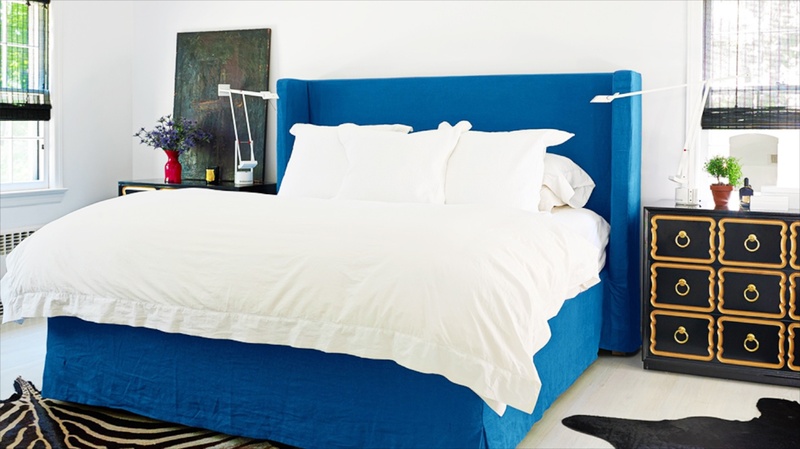 More cobalt blue with the linen headboard and bedskirt. 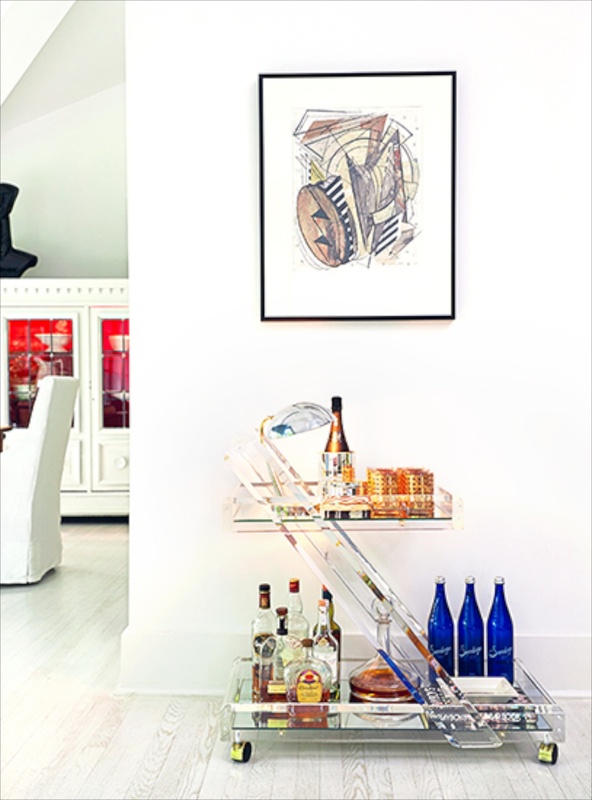 Another piece of art leans against the wall, one of my favorite ways to display clients and my own art. The black with curvaceous gold trimmed night stands provide visual interest on both sides of the bed. Simple black bamboo shades offer privacy without blocking out the light completely. What a gorgeous mirror! Mele used some of the owners already acquired art and furnishings, and supplemented with antique and vintage sourced locally in Greenwich where the home is located. He also sourced from RH, Mitchel Gold and Design Within Reach. I prefer not to feature any photo when animal hides are used. This room would have been just as lovely without the one on the bed, or with a brown textured blanket or throw at the end of the bed with equal results. Perhaps it is faux? The wall showcases the owners art beautifully. The thin, simple black frames ties the varied art styles together. Another view of this dining room. Beautiful. Mele had the entire outside of the house painted black. I tried to find a photo, but to no avail. In the woodsy setting of Greenwich, Ct., where this home is located, I am sure it is very dramatic. Well, it seems that spring is here to stay. The trees are leafing out, although behind schedule. The dogwoods and redbuds are as lovely as I can remember in a long time. I have worked outside in the gardens. This morning I came home from the market and there were 6 deer standing in my Penny Ball Garden ready to feast on the newly emerging hostas, daylilies and lirope. I got out of the car and scared them off and then went into the house and shaved two bars of Irish Spring soap and spread it around the gardens. Stinky stuff! We will have a nice weekend here, but then three straight days of rain, so this should keep they at bay until I can use the deer repel. Alternating between them should keep them from devastating the gardens. Winter already did a good job of that.